Tear Gas author Anna Feigenbaum visits Milipol. Miniature models of Norinco armoured vehicles. Photo: Anna Feigenbaum. Ever eaten a croissant at an arms fair? Welcome to Milipol. The world’s largest internal security expo, held biannually in Paris. This year’s expo drew nearly 30,000 visitors from 151 countries. It hosted prominent pavilions from Israel, France, the United States, Russia, Brazil, and China — each decorated in bold colours and flags, like the opening ceremony of the Olympic Games. Housed beneath this nationally branded flare are the world’s leaders in the policing and homeland security industry. These companies gather in Paris, and at similar expos around the world, to showcase their newest innovations behind glass display cabinets and on the HD screens of their pop-up stalls. Bowls of chocolate and expensive Italian espresso machines entice you into their stands, where you can fire a grenade launcher while sipping a glass of champagne. On October 20, 2017, just a month before this year’s Milipol expo, the Icelandic Ministry of Transport and Local Governments stopped 16 tons of Chinese tear gas bound for Venezuela. Amid economic crisis, protests in the country against President Nicolás Maduro and his government have been met with repressive, violent force. A United Nations report released in August documented 125 deaths, at least 73 at the hands of security forces and pro-government groups. Reuters reported that out on the streets protesters faced buckshot, rubber bullets and tear gas canisters shot at close range, frequently fired directly at them. In detention people documented beatings, the use of electric shocks, hanging detainees by their wrists and intentional suffocation with tear gas. Norinco stall. Photo: Anna Feigenbaum. Back in Milipol’s China Pavilion, beneath bold blue banners bearing the name Norinco, three suited salesmen stand behind a small podium, waiting for buyers. Their glass display case lined with a wide array of riot control ammunition — buckshot, rubber bullets, tear gas grenades. A large screen plays a looped demo, designed in 3D animation, like a video game. Anti-Riot Vehicles – Comprehensive Application Video. From flashing lights and sound grenades to sprays of water and liquid CS (tear gas), protesters are pummelled with greater levels of escalated force, until riot gear clad officers march over metal-gated barricades, batons out, to make arrests of the “stubborn” protesters who remain. 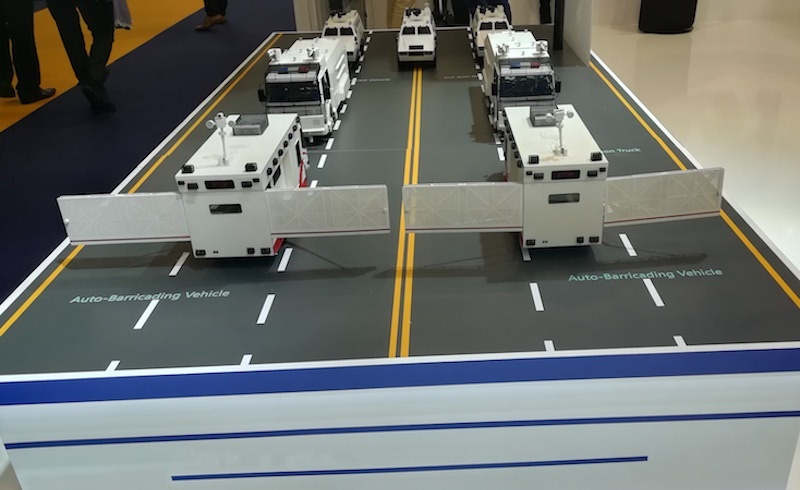 In front of the video screen a table hosts a series of miniature vehicles — detailed replicas of Norinco’s riot control solution system. The armoured vehicle doors open to reveal tiny plastic panels inside. “There’s a lever to control how much tear gas goes in the water cannon,” the youngest salesman explains. This is what makes the water feel like it burns. 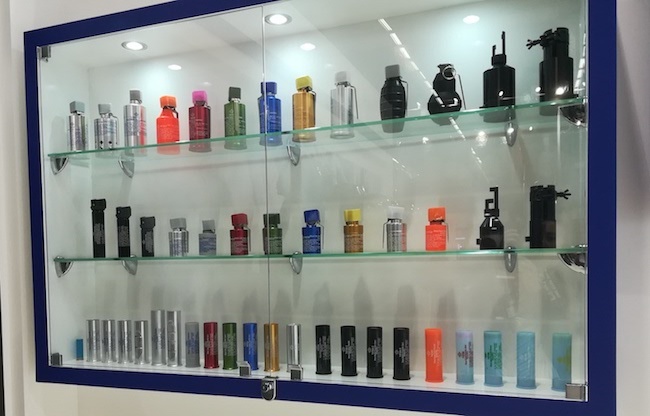 The young salesman at the Norinco stall proudly confirms it is their water cannons being used by Maduro’s police. The line is fully adaptable, reworkings of the company’s vast fleet of military vehicles, previously sold to Albania, Argentina, Bangladesh, Congo, Kenya, Myanmar, and Venezuela — among others. But when asked about the human rights violations that stopped a Chinese company’s Icelandic shipment, he looks baffled. In broken English he tells me he has no idea what I could be talking about. 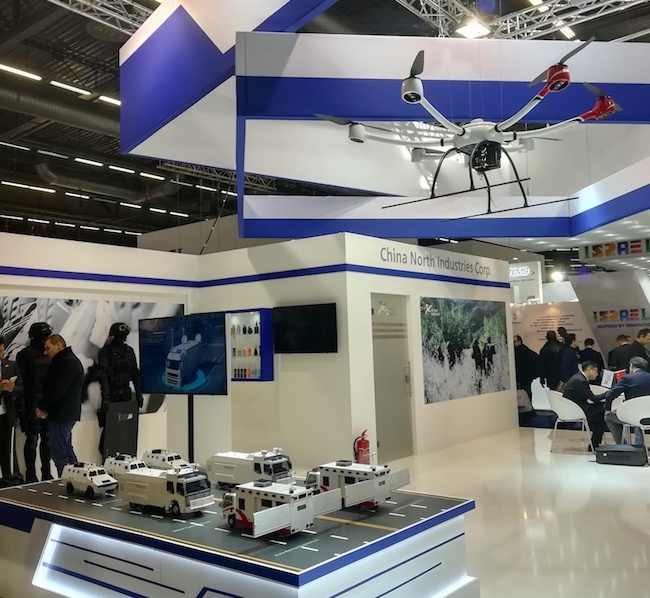 Condor Regional Sales Manager Jose´Kalil tells me the company is in favour of better regulation, framing its riot control solutions as benevolent answers to political unrest. They are the good less lethals. This move is part of the company’s efforts to clean up their image after being internationally condemned for selling to Bahrain, where dozens died from the excessive use of tear gas, and later to Egypt and Turkey, where less lethals also killed. Now, some at Condor want to renew its public commitments to upholding human rights. “We don’t want our image to be associated with bad users,” explains Kalil. Just a few months ago Condor pulled riot control shipments to Venezuela, following international condemnation of Maduro’s violent suppression of popular protests. After a decision made by the Brazilian government to halt exports, a reported 80,000 tear gas devices were not delivered, losing Condor a large sum of money in the process. But China was there to pick up the tender. Norinco ammunition display. Photo: Anna Feigenbaum. In the absence of any effective international regulation of the trade, this ad hoc system creates a marketplace where whichever company — and country — is willing to put profit before human rights can supply a repressive regime. Civilians are protected — or abandoned — depending on who in the world is watching. For those in Kenya, Nigeria and Uganda, the continual tear gassing passes with little international attention. Just days after the stopped Icelandic shipment, schoolchildren aged 3 to 7 were teargassed in Kisumu, Kenya. Two children were taken to hospital and dozens more went home traumatized. The tear gas fired into St Peter’s Awich Kodingo Early Childhood Development Centre originated with the French company Alsetex — whose products littered the "Jungle" refugee camp at Calais, where tear gas lit tents on fire, pepper spray was intentionally doused over migrant’s sleeping bags, and one woman was run over by a car, while trying to escape asphyxiation from the gas. From Venezuela to Kenya to Calais, these less lethal weapons are frequently administered as direct forms of torture. When confronted with such abuses, both states and corporations argue that it is better to tear gas than to shoot protesters with live ammunition. They point their fingers back toward the Western Democracies that not only innovate, manufacture, and supply much of the world’s riot control equipment, but also deploy these same weapons against their own civilians on the streets, as well as in home raids, prisons, detention centres, and even schools. OPCW pamphlet with truffles. via Twitter. Yet despite the piles of reports documenting such human rights abuses, and the thousands of pages of medical literature chronicling the harms of riot control, leading policy organisations have made no efforts toward creating more stringent or transparent regulations. In fact, the Organisation for the Prohibition of Chemical Weapons (OPCW) — the official group in charge of policy oversight for riot control agents — treats tear gas as a joke. 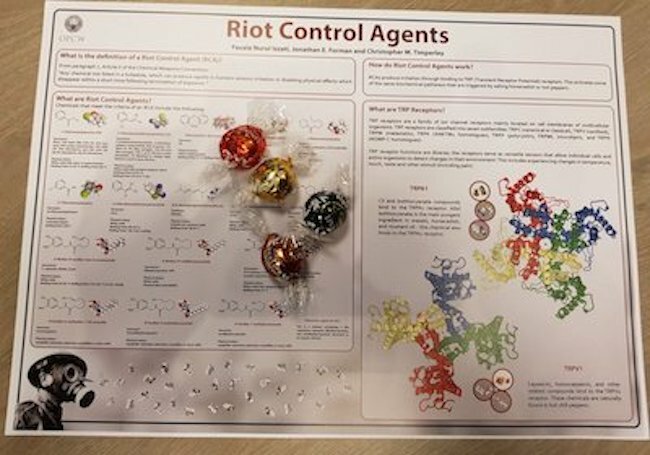 At a side event of their recent conference sponsored by the Swiss Government, a pamphlet featuring brightly coloured 3D molecules was handed out with chocolate truffles to explain what tear gas was. And the massive projector behind a panel of (old, white male) experts further detailed that the effects of tear gas was like chopping onions. This culpability of policymakers and government representatives in refusing to acknowledge that riot control is so often a form of excessive force, a practice of torture, and a strategic means to avoid addressing the causes of political unrest, leaves civilians with few places to turn. This is why the companies selling riot control must become a site for intervention. While blame of course rests with these wilfully ignorant policymakers, the law enforcement officers using force, and the governments that impose such a response, it too must be distributed to those companies making a profit off peddling their wares to known human rights abusers. To have any kind of corporate — and state — accountability we must demand, as a bare minimum, the public disclosure of all riot control equipment contracts (which are being signed with public money); along with the open, accessible documentation of all “less lethal” use-of-force incidents. Anna Feigenbaum is the author of Tear Gas and co-author of Protest Camps. Her work has appeared in Vice, The Atlantic, Al Jazeera America, The Guardian, Salon, Financial Times, Open Democracy, New Internationalist, and Waging Nonviolence. She is a Senior Lecturer in the Faculty of Media and Communication at Bournemouth University. Her website is www.annafeigenbaum.com. Follow her on Twitter: @drfigtree.